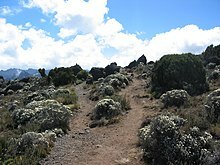 Shrubland, scrubland, scrub, brush, or bush is a plant community characterised by vegetation dominated by shrubs, often also including grasses, herbs, and geophytes. Shrubland may either occur naturally or be the result of human activity. It may be the mature vegetation type in a particular region and remain stable over time, or a transitional community that occurs temporarily as the result of a disturbance, such as fire. A stable state may be maintained by regular natural disturbance such as fire or browsing. Shrubland may be unsuitable for human habitation because of the danger of fire. 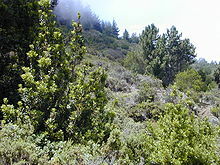 The term "shrubland" was coined in 1903. Shrubland species generally show a wide range of adaptations to fire, such as heavy seed production, lignotubers, and fire-induced germination. In botany and ecology a shrub is defined as a much-branched woody plant less than 8 m high and usually with many stems. Tall shrubs are mostly 2–8 m high, small shrubs 1–2 m high and subshrubs less than 1 m high. A descriptive system widely adopted in Australia to describe different types of vegetation is based on structural characteristics based on plant life-form, plus the height and foliage cover of the tallest stratum or dominant species. Shrubland in Prince Edward County, Ontario. In some places shrubland is the mature vegetation type, and in other places the result of degradation of former forest or woodland by logging or overgrazing, or disturbance by major fires. 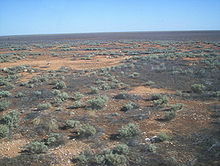 Xeric or desert scrublands occur in the world's deserts and xeric shrublands ecoregions, or in areas of fast-draining sandy soils in more humid regions. These scrublands are characterized by plants with adaptations to the dry climate, which include small leaves to limit water loss, thorns to protect them from grazing animals, succulent leaves or stems, storage organs to store water, and long taproots to reach groundwater. Mediterranean scrublands occur naturally in the Mediterranean forests, woodlands, and scrub biomes, located in the five Mediterranean climate regions of the world. Scrublands are most common near the seacoast, and have often adapted to the wind and salt air of the ocean. Low, soft-leaved scrublands around the Mediterranean Basin are known as garrigue in France, phrygana in Greece, tomillares in Spain, and batha in Israel. 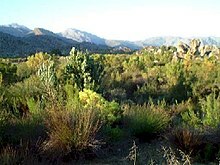 Northern coastal scrub and coastal sage scrub occur along the California coast, strandveld in the Western Cape of South Africa, coastal matorral in central Chile, and sand-heath and kwongan in Southwest Australia. Interior scrublands occur naturally in semi-arid areas where soils are nutrient-poor, such as on the matas of Portugal which are underlain by Cambrian and Silurian schists. Florida scrub is another example of interior scrublands. Some vegetation types are formed of dwarf-shrubs: low-growing or creeping shrubs. These include the maquis and garrigues of Mediterranean climates, and the acid-loving dwarf shrubs of heathland and moorland. ^ Merriam-Webster's Collegiate Dictionary, 11th Edition (2003). ^ Mares, Michael S., ed. (1999). "Fire". Encyclopedia of deserts. University of Oklahoma Press. p. 215. ISBN 978-0-8061-3146-7. ^ Woodward, Susan. "Mediterranean Shrublands". Geography 235. Radford University. Retrieved 2010-10-07. ^ a b "Deserts and Xeric Shrublands". World Wildlife Fund. Archived from the original on 2011-01-02. Retrieved 2010-10-07. ^ a b "Mediterranean Forests, Woodlands and Scrub". World Wildlife Fund. Archived from the original on 2017-01-11. Retrieved 2010-10-07.